Some pictures from a small exhibition of projects by Cancer Research UK. These panels were set up in what we call a tri-star layout; this is very useful where space is limited, but you want to use both sides of all panels while leaving plenty of walk around space. 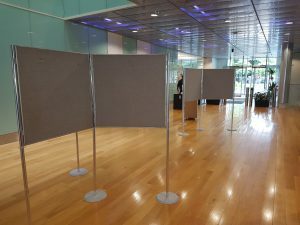 Similarly, we supplied a large stock of panels (50+) for Children with Cancer UK for an exhibition of student research projects at the Copthorne Hotel in Newcastle, and again, were pleased with the positive feedback: “Many thanks for all your help…just what we needed”. 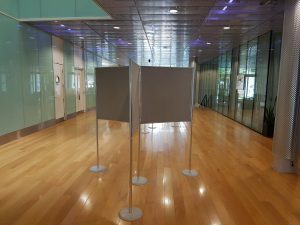 On this occasion, we were able to work with the customer on the day of set up to get the best use of the space available to acommodate all the late additional posters to the exhibition.